In 2010 I stepped out of my comfort zone and started a blog just so I could apply for the Schoolhouse ReviewCrew. To my astonishment I was accepted and have loved every minute of it. Over the last five years we have been introduced to new curriculum, new companies, and a plethora of homeschool products. My kids have had the opportunity to use products we may not have had the opportunity to use if I had not joined the Crew. We have reviewed some big name companies, new companies, and individually owned products. I have also met some of the most amazing homeschooling parents from around the world. The people who apply and are accepted to the Crew are a special group of people who love the homeschool community and are curriculum junkies. Our love of the ReviewCrew is not just about curriculum. I have had the pleasure of making some wonderful online friends & I have even met a few of them in real life. My girls also participate in a chain letter and have pen pals from across the US that have been part of the Crew. Do you homeschool? Do you have a blog? Do you love homeschool curriculum? 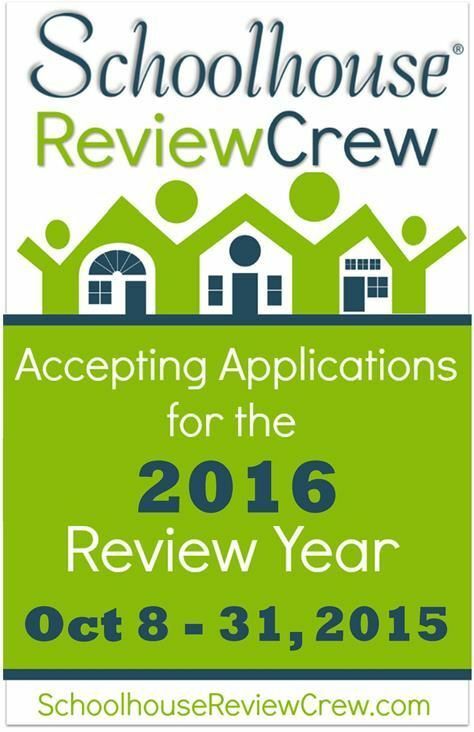 Maybe you should apply for the 2016 Schoolhouse ReviewCrew. The application will be open from October 8-31. The Crew is SO much more than the products. While we love testing new curriculum, I've also enjoyed the online friendships and all the encouragement. The encouragement is a great perk even for those who don't post alot to the forum. The friendships are the best! Glad you are a part of the team!